Internationally known harpist, Gail Barber, a brilliant and sensitive performer and a creative composer, has appeared in recital and as soloist with orchestras in the U.S., Canada, Mexico, Europe and the Middle East. An unusually versatile artist, she performs and composes music in many styles: classical, pop, folk, jazz and New Age. Gail Barber graduated from the Eastman School of Music where she was awarded the Performer’s Certificate in Harp. She has been a member of the Rochester Philharmonic, Eastman Philharmonia, Chicago Little Symphony, and Peninsula Festival Orchestras and has played under such conductors as Leinsdorf, Monteux, Martinon and Gurer Aykal. Gail has been featured at the Edinburgh (Scotland) Harp Festival, the International Istanbul (Turkey) Music Festival, the World Harp Congresses (Vienna, Jerusalem and Maastricht) and the Opening Recital of the American Harp Society National Conference. In March, 1999, she performed the featured recital for the First International Harp Therapy Conference in Richmond, Virginia, and she presented two recitals for the Congress on Cancer and Spirituality in France during June, 2000. 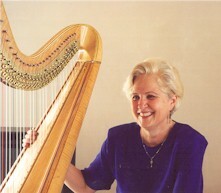 Many of her original compositions for harp (such as Windmill Sketches) relate to the culture or history of a country and are played all over the world. A recent composition, Wondrous Destiny, was premiered by the Texas Tech Harp Ensemble at the American Harp Society National Conference in 1998. Selections from Jazz for Harp, Volumes 1 & 2, were premiered at her recital for the Edinburgh Harp Festival, 1993. During her solo recital for the International Istanbul Music Festival, she premiered A Turkish Fantasy. The audience refused to let her leave the stage until she had repeated it –and she was immediately engaged to repeat the recital on Turkish network television before an audience of some 50 million people! Gail has premiered many contemporary compositions for harp, including several works by Alan Hovhaness, at his request. She recorded two contemporary concertos with the Lubbock Chamber Orchestra, Gurer Aykal, conducting: Mythos by Claire Polin and Aurolucent Echoes by Margaret Brouwer (Opus One Label). The Sergiu Natra Sonatina for Harp appears on the Dorian Reference Series Label, was endorsed by the composer, and was played repeatedly on the Jerusalem Radio. Gail is included on three new sampler CDs. Music for the Soul and Millennium: Music for the Solstice include improvised music for healing. Especially interested in the use of the harp for music-healing. She has worked extensively with a holistic health care practitioner, Dr. Ingrid Naiman, in Santa Fe, NM, in providing intuitive music (spontaneously composed) for clients. In December, 1996, in honor of her harp career and her leading edge work in music therapy, she was awarded the M.D. (M.A.) degree from the Open International University of Complementary Medicine and Medicina Alternativa Institute in Sri Lanka. Medicina Alternativa is under the auspices of the World Health Organization of the United Nations. Gail has recorded for Mercury, HBN, Opus One (NY), Countdown Productions, CRS, Dorian Systems and Lyrical Light. Gail attracted outstanding students from all over the world to Texas Tech University, Lubbock, TX, where she was Professor of Harp until her retirement. At Texas Tech, she directed the Harp Ensemble and coordinated the yearly Harp Festival. She taught both Harp and Music Theory. 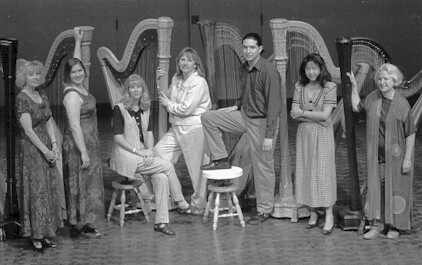 The Texas Tech Harp Ensemble performed at the American Harp Society National Conference in June, 1998. Included on their program was the world premiere of “Wondrous Destiny” by Gail Barber, a new work for harp ensemble, which also utilizes Tibetan Chimes and rubber mallets. Shown from left to right are: Elizabeth Clarke, Kristi Flake, Jodi Hiser, Carol Reid, Ricardo Rasura, Mengting Shieh and Gail Barber, Director.